Sakai incident” (堺事件, Sakai Jiken). 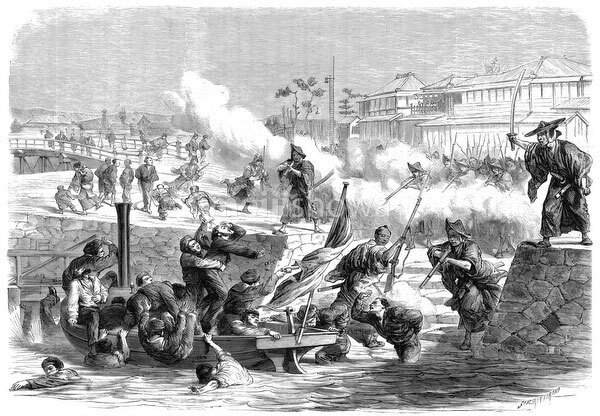 Samurai of Tosa Province (in current Kochi Prefecture) attacked crew members of the French corvette Dupleix when they landed at Sakai near Osaka on March 8, 1868 (Keio 4). Twelve Frenchmen were killed. Twenty of the samurai were sentenced to death by seppuku, but the French requested grace for nine. Published in the French illustrated weekly Le Monde illustré in 1868. Art by French artist Godefroy Durand (1832-1920).